The GDPNow Model forecast for 1st quarter 2017 GDP plunged 0.5 percentage points to 1.3% following recent economic data. Today’s dismal trade data was not a factor. Advance trade data on February 28 showed the trade deficit in goods jumped 7.6% to $69.2 billion, and that data was already factored into the model. The reason for today’s plunge was light vehicle sales on March 2 and the factory orders data yesterday. The GDPNow model forecast for real GDP growth (seasonally adjusted annual rate) in the first quarter of 2017 is 1.3 percent on March 7, down from 1.8 percent on March 1. The forecasts for first-quarter real personal consumption expenditures growth and real nonresidential equipment investment growth fell from 2.1 percent and 9.1 percent, respectively, to 1.8 percent and 7.3 percent, respectively, after Thursday’s motor vehicles sales release from the U.S. Bureau of Economic Analysis. The forecast of the contribution of inventory investment to first-quarter growth fell from -0.50 percentage points to -0.72 percentage points after yesterday’s manufacturing report from the U.S. Census Bureau. The auto sales report took off 0.3 percentage points from the March 1 estimate. The factory orders and shipments report took off another 0.2 percentage points. 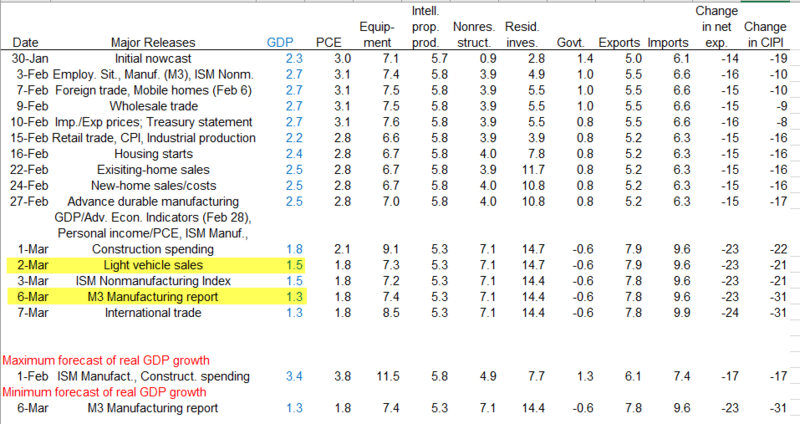 ISM services did not affect the model, nor did today’s trade report. Meanwhile, and in a switch in roles from a month or so ago, it is the New York Fed Nowcast Model that seems wildly high. The Markit forecast was made by Chris Williamson, Markit Chief Economist. For details, please see PMI Services Lowest Reading in 5 Months; ISM Services Highest Reading Since October 2015. First Quarter GDPNow Forecast 3.4 Percent: How Many Believe That? I do not buy this enormous jump in predicted GDP for one second. For 4th quarter of 2016, the final Nowcast was at 2.1%,. 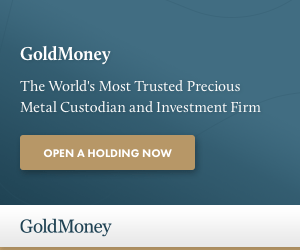 GDPNow was at 2.9% off a full percentage point. 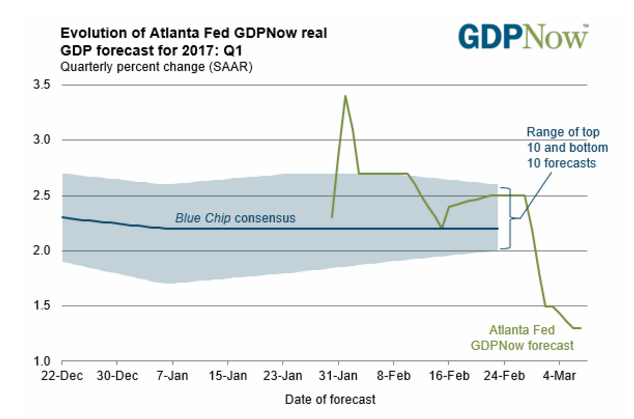 When looking at this latest GDPNow forecast of 3.4%, I will place my typical mental bet when looking at these hugely optimistic forecasts: “Take the under, way under”. March 1: GDPNow Forecast Plunges to 1.8% Following Personal Income and Outlays Report. If the latest GDPNow estimate is close to the mark, it will be amusing watching the Fed hike in what they label a “surprisingly strong economy”. Well, higher interest rates should help. LOL. And I can’t wait until Friday to see how many TENS (if not HUNDREDS) of THOUSANDS of “new jobs” were created during February, while the economy was growing at a 1.3% annual rate. It’s not “data”…it’s only more silly “surveys”…and only of a very very few selected “large establishments”. This is akin to tea-leaf reading. I’ll settle for 1.9. The diff from the median to the top is .6%, subtract that from the median you have 1.9, within range of the forecasts, giving credence to the notion that it’s a miss, without crying chicken little. Because GDP has been in a range, the data is being overweighted, the bean counters are forced to make something where very little evidence one way or the other exists. The fed wants stability, there’s nothing here to cause a panic. they’ve got stability, that means they can raise. Final answer. How many economist can you fit on the head of a pin? Old joke: economists were introduced in order to make weathermen look good. Mish I’m curious as to how you support reducing your GDP forecast with an article and chart over on ZeroHedge “US Consumer Spending Highest Since 2008 As Economic Confidence Hits Record High: Gallup” seeing as how I respect your opinion more than Gallup’s I should have asked the question the other way around. Gallup – and their survey – is a joke. Survey respondents “self report” their spending. Nate Silver called out Gallup following the 2012 election on their poor prognostication. About those new vehicle sales …. The Fed better hurry up and get those “three rate hikes” in quick – before the economy falls into recession (sometime in 3Q-4Q), so they will have some room to then cut – without going below zero. Trump pr0mises versus reality, which will drive the markets. Remember that figure of 1.3% is still inflated by (a|) imputations especially owner occupier rents, (b) duplication especially profits made in finance that are completely fictitious and finally the continuing increase in Federal spending in real terms. The rest is fuelled by the merry go round of cheap credit, soon to end, as in the car industry where most of the sub-prime auto loans are made by the car companies themselves. It is likely that net prices for vehicles are falling. I think the car companies are being disengeneous because the increase in rebates is bigger than the increase in sticker prices. It will be interesting to see their quarterly margins in April. Last quarter my calculations showed a reduced profit margin versus Oct-Dec 2015. This is not a dynamic economy but a credit fuelled economy.